The pictures from troops that are in Iraq. They are based at TQ, which is an old Iraqi airbase west of Baghdad, near Fallujah and is being run by the Marines now. 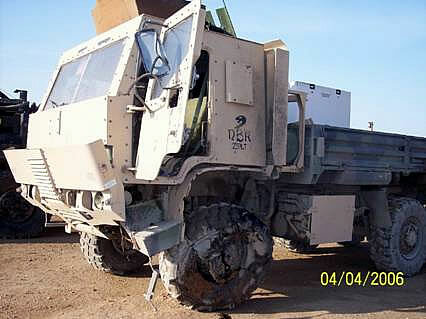 You can see where the IED exploded up through the cab. No one was seriously hurt, the driver got shrapnel in the leg and the gunner got his ear drums hurt. The Artillery Battery was sent over as a provisional trucking company but they were redirected somewhat in their mission and they are doing a lot of convoy security. They have had four vehicles hit by IED�s, two hummers and two LMTV�s. The oddest fact about it is that the 50 cal gunner was the same person for both of the IED hits on the LMTVs.